An incredible journey that combines three very different geological locations in the Southwest: The Colorado Plateau, The Great Basin, and The Mojave Desert! The Big Three Tour from Las Vegas offers a unique and memorable experience of three distinct geographical areas that are fantastic examples of the human and natural histories. Ghost towns, ancient petroglyphs, stunning scenery, and so much more! Our small group size allows for a more intimate experience and access to more isolated destinations that coach tours cannot offer! Departing early from Las Vegas, our first stop will be Pipe Springs National Monument to experience an authentic outpost that has been used for centuries by the Paiute Indians and early European explorers. We’ll enter Zion National Park from the East Entrance and into the incredible high country of Zion. Descending into Zion Canyon through a near century old tunnel is unforgettable! Follow the paths where ancient native people and pioneers walked and gaze up at massive sandstone cliffs of cream, pink, and red that soar into a brilliant blue sky. 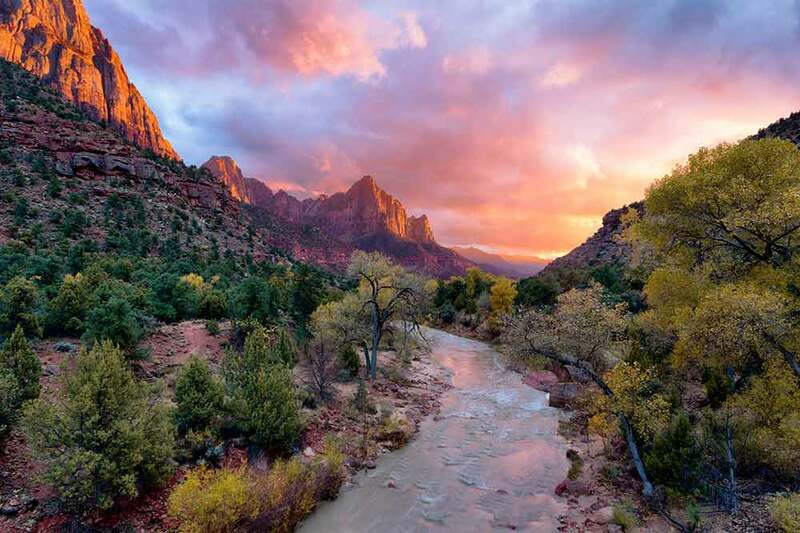 Experience Zion’s unique array of plants and animals that will enchant you as you absorb the rich history of the past. In the afternoon, you will enjoy a delicious lunch at Zion Park Lodge. After lunch, you will have a free afternoon to explore the river trails, visitor’s center, or maybe join a National Park Ranger on a guided walk. The sky’s the limit in Zion! A late afternoon drive will take us north to the historic Mormon town of Cedar City, Utah for a walk around town and dinner. Today, we’ll journey west to Great Basin National Park and cruise on a breathtaking, scenic drive to the Wheeler Peak campground, located at 9,886 feet in elevation. Here, you can enjoy a picnic lunch and leisurely stroll through the aspens or, for those wanting a more of a challenge, a 2.8 mile round trip (roughly 2 hour) hike to see the magical Bristlecone Pine Forest, where the oldest trees in the world twist majestically atop the breathtaking Wheeler Peak. Then, we will take our explorations underground with a ranger-guided tour to marvel at the gravity defying stalagmites and stalactites of the Lehman Caves. We’ll end the day in Ely where you can view colorful murals or visit the White Pine County Museum. To start the morning, we’ll visit the Nevada Northern Railway National Historic Landmark in Ely, the sole survivor from the Grand Era of Railroading in the state. After enjoying a history lesson, we’ll head west along Highway 50, dubbed “The Loneliest Road in America”, along one of the main stretches of the original Pony Express Route. The road traverses two mountain ranges through some of the most isolated lands in the lower 48 states. Ancient petroglyphs in the area are evidence of prehistoric hunting and dwelling sites dating back to 10,000 B.C. The views from the summits are incomparable! We will end the day in the historic mining town of Tonopah for a chance to relax and unwind before we continue our exciting journey. An early departure to explore the incredible remnants of Rhyolite Ghost Town, once a bustling mining town of 5000 that had schools, a hospital, a thriving red light district, and even an opera house. You’ll feel the history of way back when! As we continue on to Death Valley National parks, our tour makes a gradual descent into this ancient sea bed, with the lowest point, Badwater Basin, at 292 feet below sea level. View Devil’s Golf Course and Zabriskie Point, overlooking Golden Canyon, which offers stunning views of the vast valley below, and the Panamint Mountains rising over 11,000 feet. After a day of discovery at our final stop, we’ll return to Las Vegas, just in time for some well-deserved rest or to continue the fun on The Strip! ARE YOU READY FOR 4 DAYS AND 3 NIGHTS OF ADVENTURE? Every day of this tour is filled with western history, legends, Nevada’s hidden gem of natural beauty, and of course, excitement!